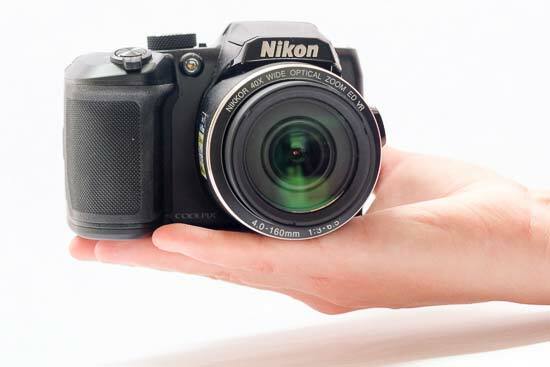 The Nikon Coolpix B500 is a bridge camera with a 16 megapixel sensor, which is paired with a 40x optical zoom. You can also activate a digital zoom up to 80x. It offers a range of shooting modes, but there’s no manual control, and it can’t shoot in raw format. As such, the intended target audience is beginners and possibly enthusiasts looking for a simple backup or travel camera. Like many of Nikon’s most recent cameras, it features SnapBridge technology, which allows you to maintain a constant Bluetooth link with your smartphone to send images across as you take them, ready to share on social networking sites and the like. Other interesting features include a 3.0-inch tilting screen, which features a 921k-dot resolution, inbuilt Wi-Fi and Full HD video recording. 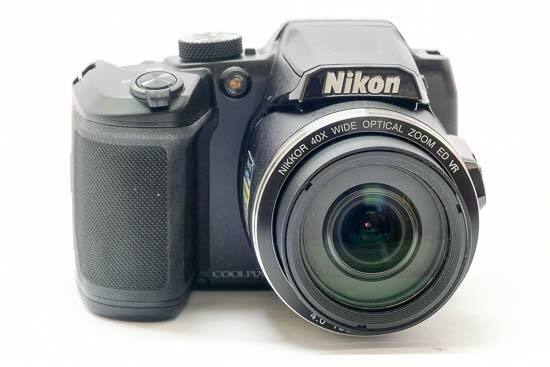 The Nikon Coolpix B500 retails for $299 / £219. The Nikon Coolpix B500 is a mid-sized bridge camera, being not the smallest in size on the market, but also far from the largest. It has a chunky hand grip that protrudes quite far from the body and makes it feel pretty secure in the hand. It is also textured which helps to add to an air of quality about the camera. The rest of the camera is not textured. Being reasonably lightweight, it’s possible to hold the camera one-handed to get your shot, but you may find that using your other hand to hold the camera steady feels more natural and comfortable. On the top of the Nikon Coolpix B500 you’ll find a dial for switching between the various shooting modes that the camera offers. There’s no manual modes available here, but there’s quite a few options placed on the dial for you to choose from. This includes fully automatic, scene, creative, movie mode and more. 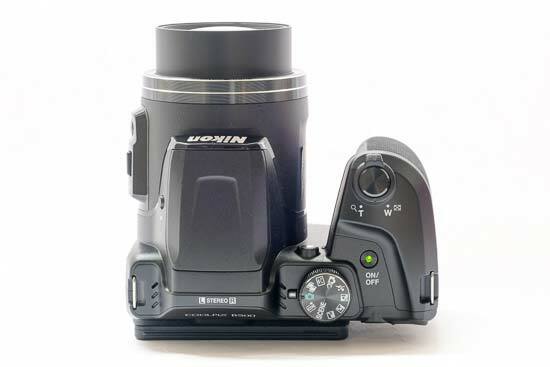 Also on the top of the Nikon Coolpix B500 is a zoom rocker which is found around the shutter release. You can push this to move from wide angle to telephoto, but there’s also another way to alter the zoom length if you prefer. On the side of the lens there’s another switch which you can push up and down to zoom in and out. Next to this zoom switch is a button which is very useful for helping to frame shots when using longer focal lengths. If you press it, and keep it held down, the zoom will lens out, allowing you to find any subject that may have moved out of shot. When you’ve found the subject again, release the button and the zoom will move back in to the same focal length as you were previously using. A inbuilt flash is found on the top of the Nikon Coolpix B500 also. There’s a button to press to raise it, which you’ll need to do since it won’t pop up automatically. When you’re done using it, you simply push the flash back into place. Moving to the back of the camera, all of the buttons here are placed on the right hand side of the camera meaning you have easy access with your right thumb - especially useful if you have decided to shoot one-handed. The layout here is pretty traditional. There’s a four way navigational pad, with each button having its own particular function - there’s up to control flash mode, down to switch on macro shooting, left to use the timer, and right to adjust exposure compensation. In the centre of the navigation pad is an OK button, which you can use for various menu functions and so on. Around the navigational pad are four buttons, again each with a specific purpose. There’s a playback button, a display button, a menu button and a delete button. Just above the rear thumb rest is also a direct video record button, which is hidden away just enough to mean you shouldn’t accidentally press it when you don’t want to, but still within easy reach when you need it. The rear screen tilts up and down, pulling slightly away from the body on its bracket. You can’t face it forward for selfies, or use it in portrait format, but it’s still never-the-less useful for some awkwardly angled shots. The screen is not touch sensitive. Despite its name, the fully automatic mode actually gives you the most amount of control over camera settings. While you can’t change aperture or shutter speed, it’s possible to change white balance and ISO sensitivity. You can also leave both of these settings in automatic too, if you prefer. If you want to, you can change the AF setting to allow you to set your own AF point. 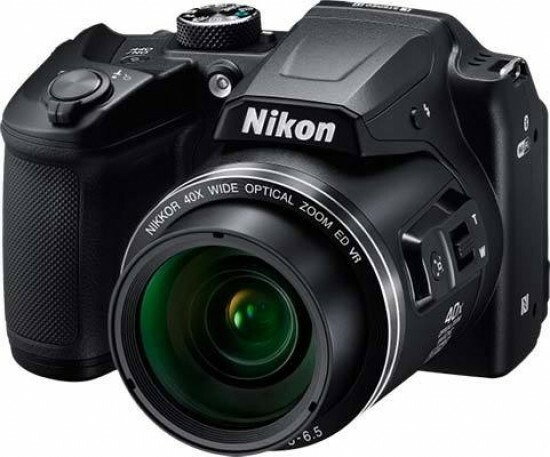 Alternatively you can have the Nikon Coolpix B500 decide one for you, track a subject, or always use the central point. Once you have selected “Manual” AF point, in normal shooting mode you can press OK, then use the navigational keys to move around the screen to the point you want to focus on. Also available in this menu is the ability to change image mode, continuous shooting, and more. You’ll also find some different movie options, such as frame rate and so on. You can change some settings such as date and time from this main menu too, as well as access the connection settings. 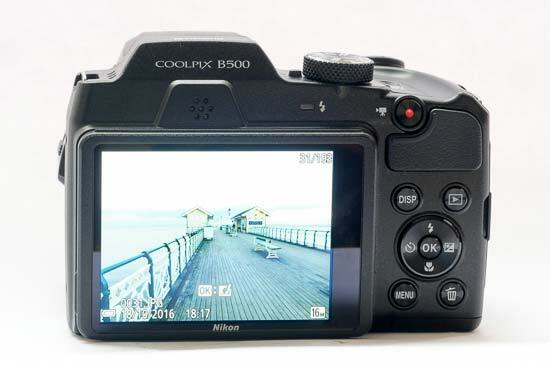 The Coolpix B500 uses Nikon’s Snapbridge technology, which means that you can set up a low power Bluetooth connection with your smartphone that is constantly maintained. This means that images are sent across as you take them, ready for you to share online if you choose. The camera also has Wi-Fi, which is quicker for sending larger size photos across to your phone than Bluetooth. If you’re using SnapBridge its best to set the images to be transferred at a smaller size than full resolution for better speed. A few of the other modes on the mode dial are also quite interesting. If you select Creative Mode, you’ll be able to choose from a selection of different “sets”. Take the picture, and the camera will take one as normal, but also apply four different filters to the shot. You can choose between sets such as “Light”, “Memory”, “Classic”, “Noir” and so on. Short Movie Show is also quite fun for events and so on. You can use it to create short clips of a couple of seconds, then amalgamate them all into one video - everything is done automatically in-camera. The Nikon Coolpix B500 is powered by AA batteries. This will be liked by some, but hated by others. On the plus side, should you run out of battery power, you should have no problem finding a replacement set in a shop wherever you are in the world. However, it also means that you’ll always be paying out for new batteries. It may be worth investing in a set of rechargeable batteries to save money in the long run. In good light, focusing speeds are generally pretty quick, and usually accurate. With macro focusing, it can take a couple of attempts to get it right, so you should be careful when attempting to take close-up shots that the camera has correctly focused. That said, the camera does allow you to get very close indeed, which can be useful.